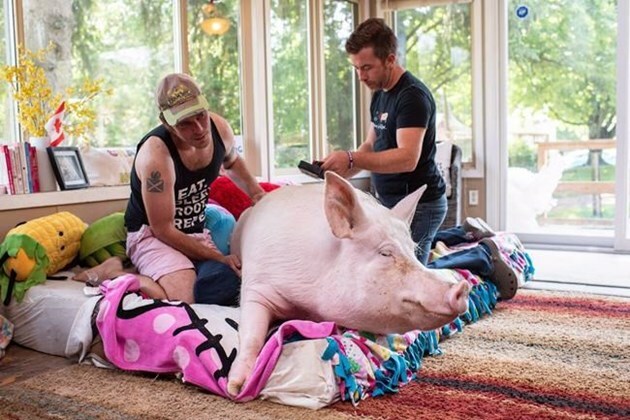 Esther the Wonder Pig diagnosed with cancer following CT scan, expected to undergo surgery. The fight to bring a first-of-its-kind CT scanner to Canada has proved to be life-saving for Esther the Wonder Pig, but it has also had a downside. Esther’s owners, Steven Jenkins and Derek Walter, fundraised to bring the necessary CT scanning equipment to Canada after the 650-pound pig fell ill in November 2017. But what they initially thought were musculoskeletal issues turned out to be something more serious: an Aug. 9 scan showed four tumours in Esther’s mammary glands, one of which tested positive for cancer. Jenkins says the cancer appears to be in early stages and tests have determined it has not spread to other areas so far. Esther is scheduled for surgery in the next few days. The scan also revealed no musculoskeletal issues, but the medication Esther was given to treat her illness potentially caused an ulcer to form in her stomach, resulting in further mobility complications. After scrambling for months for a definitive diagnosis for Esther, Jenkins and Walter, now owners of the Happily Ever Esther Farm Sanctuary in Milton, raised $651,000 to import a scanner suitable for Esther and other large animals. It will have a permanent home at the Ontario Veterinary College in September. Jenkins said it still surprises him that — before his and Walter’s intervention — this level of care for large animals did not exist in Canada. Despite the sad news for Esther, Jenkins said he is grateful to be working with experts in both Canada and the U.S. on further research. The college also recently began offering a course about caring for large companion animals, a huge step for animals like Esther. “You get vets … that are now being forced to look at an animal that — like everybody else — they saw in a specific way and are seeing them from a different perspective, which is really, really cool,” Jenkins said.